UPDATE: Abs-Cbn published a footage of the chatters between Sen. Cayetano and Trillanes when De Lima put the session on recess. It can be heard that Trillanes is trying to prevent Cayetano from speaking. Trillanes shut down the mic of Cayetano then said "hindi kita papopormahin." Watch the conversation that was not heard during the live broadcast of Thursday's senate hearing. Politics is indeed more fun in the Philippines. 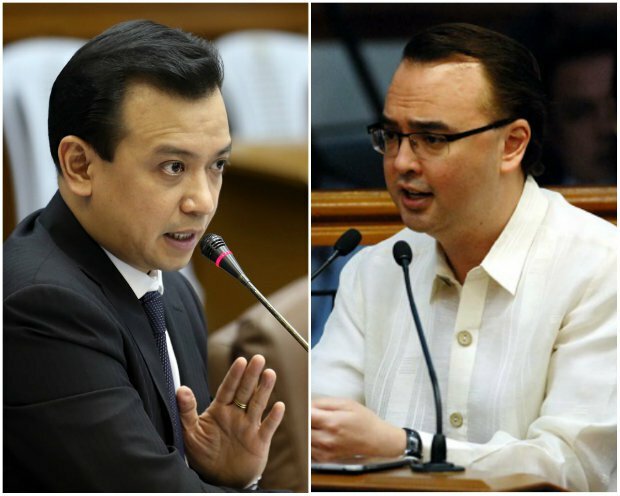 Earlier today at the senate inquiry on EJK cases in the Philippines, senators Trillanes and Cayetano got into a heated argument while interpolating a witness. Cayetano was trying to establish (or break) the witness' credibility when Trillanes tried to stop him from asking further questions. Trillanes lost his cool and egged De Lima to cite Cayetano as 'out-of-order'. He then told Cayetano "Hindi talaga kita palalampasin." The entire incident was aired live on national TV. Watch the entire scene below courtesy of CNN Philippines.